Jimmie Cone, now immortalized in comic form. Every Thursday I get an e-mail saying how many people have been reading Just Up The Pike in the past week. This morning, I woke up to discover that pages on the blog have been viewed 23,000 times since last Thursday. That may not be a lot to some people, but it's a lot to me. To compare, we get between 25,000 and 30,000 pageviews each month; in July 2009, there were nearly 49,000 pageviews. How did this happen? I thought. So I checked Google Analytics to see where our traffic comes from. Most JUTP readers who click over here from other sites do so from Silver Spring, Singular or Greater Greater Washington, leading me to assume that we are just part of your daily balanced blogging diet. This week, however, people are coming from another site called Girls with Slingshots. 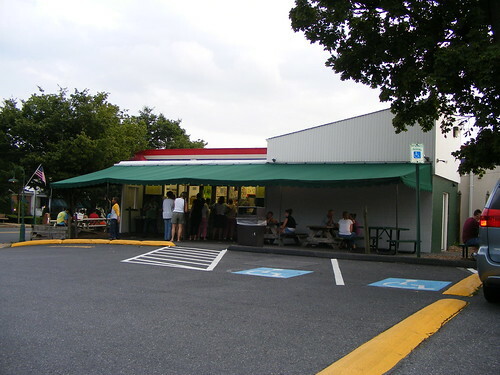 "After little league games, you’d find every member of every team huddled up under the rickety green roof of the Jimmie Cone in Damascus, Maryland. It was the closest you could get to having a local pub setting for elementary school and junior high kids. Which is funny, since Damascus is a dry town." Over the next two days, Girls with Slingshots sent over 15,000 people to JUTP, one of whom is the co-owner of Charmington's, a coffee shop in Baltimore I mentioned in a post last week. Small world, right? Not everyone thinks skateboarding is important, but it seems many people who read this blog think differently. Or I write a lot about kids and skateboarding and the sample's skewed. Either way, I never got to go to Jimmie Cone this summer. Lame.